“Boys And Girls” and “Valentine’s Day” are middle-of-the-road Office episodes that are almost more fun to dissect than they are to watch. 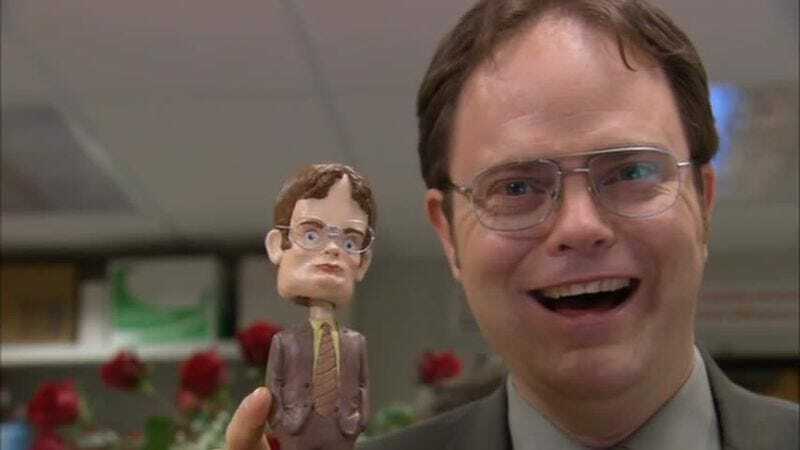 They get their laughs in when they can, and they present moments that matter to the series—in terms of story arcs: Pam’s talking-head breakdown; in terms of punchlines with marketing potential: meet the Dwight bobblehead! However, it’s more intriguing to me that these episodes lay out the separations and divisions within Dunder Mifflin. 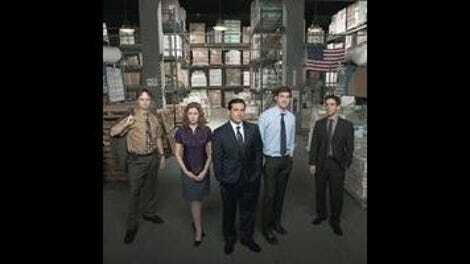 The Office’s cast of characters are cordoned off by boundaries societal (race, gender, class) and corporate (job title, department), and the great challenge of the show was to build a universe where those differences could generate comedy while preserving the common ground beneath the characters. The writers and producers would eventually choose one of the easiest paths to achieving that goal: office romance. With The Office’s late-season tangles of love triangles still a recent memory, watching “Valentine’s Day” is a bit like hearing Dwight describe the ways love can be used as a trap. It certainly makes Michael’s talking-head update on the Jan situation look like prescience on the part of “Boys And Girls”: “To run an office, you need men and women. You know why? Because you need to have that crazy sexual tension to keep things interesting.” With the story reserves low and the options for untapped character pairings dwindling (the latter an occupational hazard of a workplace comedy), the show would return and return to the office-romance well during its last four seasons. The Office caught lightning in a bottle with Jim and Pam, and you can’t very well blame the creative team for trying to capture that spirit again. Least of all on a holiday celebrating romantic love. The upside to this is how well Dwight and Angela’s scenes in these episodes give sporadic release to the tension that drives the Jim-and-Pam story. I’ve brought this up on the site before, but I think the ’shipping of the floppy-haired salesman and the timid receptionist tends to overshadow what is the American Office’s most entertaining romance (at least until Andy Bernard enters the picture). There was precedence for Jim and Pam, not just in the original Office but in most TV love triangles where someone single pines for someone who’s spoken for. Angela and Dwight, meanwhile, produced this weird, mutant love story, so creepy in its businesslike discretion, yet so appropriate for the characters and oddly endearing. (“I’m in the healthiest relationship of my life,” Angela tells The Documentarians during “Boys And Girls”—over footage of behavior that only she and Dwight would term “healthy.”) The way they each light up at the specific, thoughtful Valentine’s gifts they’ve secretly purchased for one another, it’s no wonder the wedding The Office actually ends with is Dwight and Angela’s. There is a downside to what “Valentine’s Day” introduces, however, and it’s the absolute pileup of romantic storylines that begins in earnest with the episode. The show wouldn’t confine these feelings to February 14: This episode’s conclusion lays the pipe that leads to “Casino Night,” Urkel Grue, and “Dinner Party,” while Kelly and Ryan’s destructive off-again-on-again-off-again (on again?) affair begins with poor timing on The Fire Guy’s part. It’s novel now, but the strain would show in time. At least “Valentine’s Day” ends the teasing of “Boys And Girls” and finally lets Jan plant another one on Michael, right? Like the funhouse version of Jim and Pam that Dwight and Angela provide, parallels abound between Jan and Michael and Kelly and Ryan—not the least of which being the way one part of each pairing takes the other’s gestures way, way too seriously. But RyKell (Kelyan? Kapooward?) is introduced for its volatility—while there’s drama inherent in any of the show’s romantic pairings, this is the one the writers’ room always used as its outlet for car-wreck-style stories of love. Michael’s thing with Jan is more important for the evolution of the character. Sure: It’s an evolution that feeds off of—and then ruins—a perfectly good female member of the supporting cast. (Jan’s strong-willed in these two episodes, but she’s nowhere near the toxic, silicone-enhanced stew of crazy she’d leave The Office as.) But it’s also a development that helped push Michael Scott along to his eventual redemption, the guiding light that always kept the show on track. And if it gave the second season one more secret to blow, all the better. Following the events of “The Secret,” the last ticking time bomb season two has left involves whatever happened between Michael and Jan after they got swept up in the amorous atmosphere of the Chili’s parking lot. Accounts continue to vary, and the upstairs-downstairs conflict of “Boys And Girls” is at least driven in part by Michael’s insistence on getting that all important closure, and his continual misreadings of “I guess I missed you” and other signals that Jan just isn’t that into him. But it turns out that she is, kinda sorta, and it’s there where the most powerful material in this week’s episodes lies. It gets some stiff competition from the way Jim and Pam understand each other’s basic needs (and still have a hulking, Roy-shaped obstacle preventing them from acting on this understanding), but the most illuminating sequence in either “Boys And Girls” or “Valentine’s Day” is the way Michael covers his tracks after his faux pas in front of newly installed CFO David Wallace. Michael isn’t “a complete lunatic,” as that email from Jan implies. It’s just that somewhere down the line, he was convinced that his ease with public speaking and his generally amiable demeanor equipped him to be an entertainer. He’s not: He’s just a guy who’s good at talking himself out of a tight spot, a guy who’s also skilled at charming strangers when he’s not trying to impress them. Footing factors hugely into a Michael Scott victory: When he’s in a humbled position, when someone breaks through the fog of impressions and Airplane! quotes to make him realize other people aren’t gazing up at him as if he’s onstage, he can make something happen. He can close the sales deal. He can lead the Scranton branch. He can successfully Jedi mind trick David Wallace into thinking that Michael and Jan never spent the night together. It’s not the character’s funniest setting—but having multiple settings that are believably inhabited by the writing for and portrayal of Michael are what make him a character worth watching. Like the “many faces” depicted in his saccharine presentation to Wallace, Jan, and the other branch managers, there are divisions and segments within Michael, but they manage to pull together to make a fictional figure who’s not only human and relatable—you can even understand what Jan might see in the guy. She’s seen what a mess he made of the warehouse, too, so clearly there’s something redeemable in Michael that The Office only allows to peek out at important moments. Between Michael’s Halloween costume and that shot of Dwight and his bobblehead, season two has a lot of fun with representing the “two faced” conceit of the mockumentary setup. All of the singles in the office have their way of dealing Valentine’s Day: Meredith’s mixed-drink solution is explored in a pair of spy shots that artfully riff on what would’ve been made too obvious by a talking head. Hey, it’s 2006! : Says Dwight, as the men of the office descend upon the warehouse: “Remember on Lost when they met the Others?” Which, to be fair, was still a pretty fresh development when “Boys And Girls” first aired.